A type of ladle used for serving punch. Punch was a popular party drink introduced in the middle of the 17th century. The name is derived from the Sanskrit panca, meaning five and pointing to the five key ingredients: water, sugar, limes or lemons, spices and spirit. The 17th century punch ladle was a substantial piece of silver with heavy round bowl and a silver handle. Due to the scarcity of silver at the beginning of the 18th century new styles had to be developed. The introduction of a non-silver handle and lighter bowls were natural consequences. Around 1735 the bowls were round or egg shaped while the double lipped often fluted bowl was introduced around 1740. Fancy bowl shapes like the shell of nautilus were also popular around the middle of the century. Oval bowl shapes - fluted or plain - with shaped out spouts at one end were popular, probably because it facilitated the pouring of the punch. Many punch ladles have coins inset in the middle of the bowls. The coins are mostly earlier and should not be used as dating indicators for the ladles. Handles were made of wood, ivory, ebony or whale bone. The later was heated under pressure with steam until malleable and then twisted into ornate spirals. The end of the handles are often capped with a silver finial, thistle finials on Scottish ladles are relatively rare. Ebony handles have sometimes ivory or bone finials for a nice color contrast. Some ladles show monograms, crests or coat of arms. 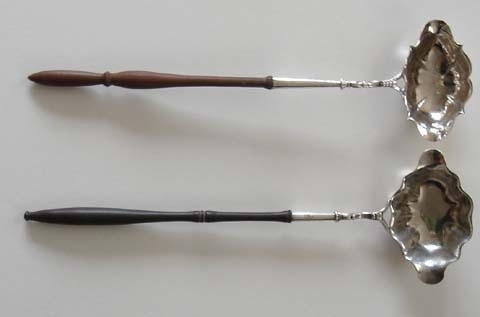 In the 18th century decoration was used sparingly contrary to late Georgian and early Victorian ladles which were often heavily chased. information and images about punch ladles are kindly supplied by Dorothea Burstyn.